Emma Triumphs at Tamworth Again! Kingsbury Water parkrun on Saturday morning was quieter than usual, down to the wet weather and a busy race schedule on Sunday, with only a few hardy Peelers braving the conditions. Mark Boffey led the club home in 23.55 mins, followed by Stuart Hatton in 24.33mins, George Hope in 25.35, Owen Slater in 25.51, Marcus Fairburn in 26.02, Lisa Fletcher in 30.30, Caroline Evans 32.06 and Simon Gordon in 37.27. Elsewhere Andrew Pickard completed Sheffield parkrun in 24.10 and Robert Hirst (26.16), Michael Stevenson (28.43) and Christine Norris (36.28) visited the Bedworth event. Malcolm Bembridge completed the Chester marathon in a new personal best of 3:40.57 hrs and Chris Taylor completed the Cardiff half marathon in 2:13.06 hrs. Michael Shelton completed the Bournemouth marathon in 4:10.30 hrs whilst carrying Trev, a four foot tall toy bear on his back! 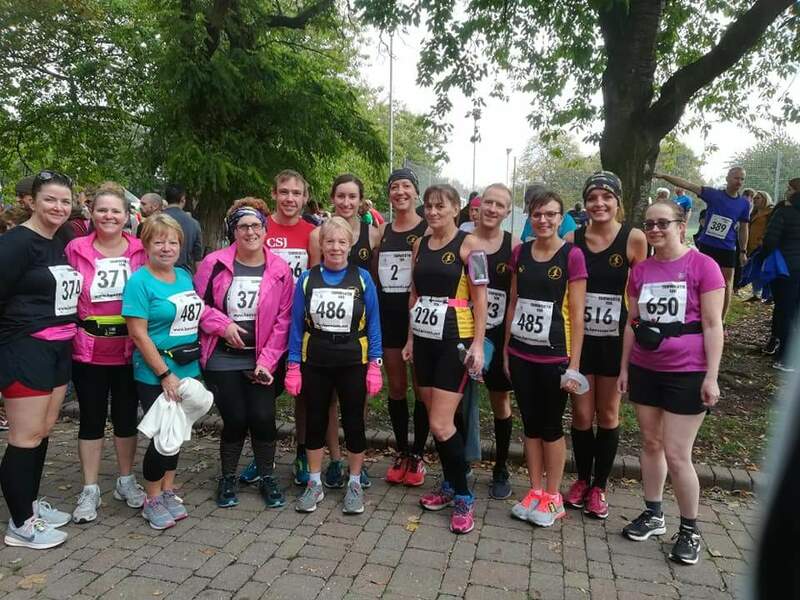 Closer to home there was a strong turnout on Sunday for the Tamworth 10k,including some newer club members running their first 10k races. First home for the club was Lawrence Williamson who was seventh overall in 35.50 mins. He was followed by Emma Pick in 38.08 mins who won the ladies event for the second year in succession with a new personal best, some 5 minutes quicker than last year. Sandra Ingram (51.36) and Sophie Galloway (52.13) also recorded new personal bests and Jackie Tierney completed the course in 56.45 mins. Emily Holliday completed her first 10k in 1:04.11 hrs followed by fellow rookies Ann Hill (1:08.27) and Janette Faulkner (1:10.46). Christine Norris also completed the course in 1:11.46. Well done to all.